The cup and saucer from the Delfts Blond series are made of pottery. 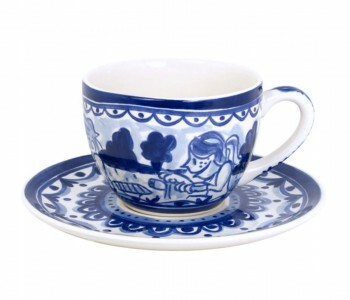 The cups from the Delft Blond series depict a blue artwork of a typical Dutch mode of transport: bicycles. The cups have a handle with a mini clog attached, typical for the Delfts Blond series. In a small workshop on the Spuistraat in Amsterdam, two friends from Brabant started painting kitchenware. Today, the kitchenware collection of Femque van Geffen and Janneke Dröge is extremely varied. The kitchenware has the brand name 'Blond Amsterdam'. Within the Blond Amsterdam Collection, they created a Delfts Blond series with great artwork that characterizes the Netherlands. This series is not comparable with the porcelain products known as ‘Delftware', but certainly is a unique spin on them. Attached to the ear of the cups are a brand label and a small clog, characteristic for the Delfts Blond series by Blond Amsterdam. 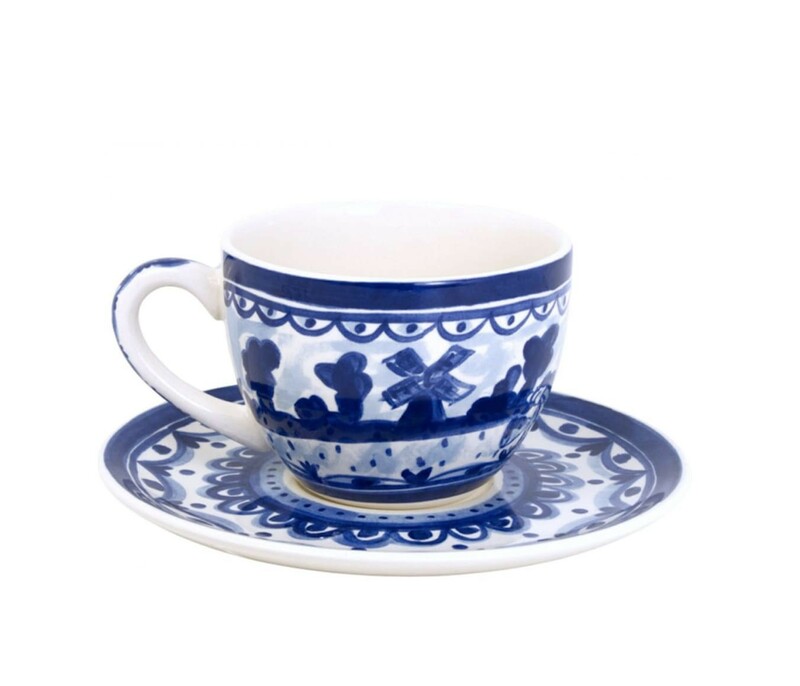 This cup and saucer are made of pottery and depict a typical Dutch mode of transport: bicycles. Similar to Delftware, the cup and saucer have the colours blue and white and are sold as a set. The size of the cup is 8,5 cm high and contents 0,35L. The saucer has a diameter of 11 cm. The cup is heat resistant and is suitable for drinking milk, coffee, tea, or other warm drinks. The cups from the Delfts Blond series can be easily combined with the cup and saucer, the mini mug, the teapot, and the sugar pot in the Blond Amsterdam series.